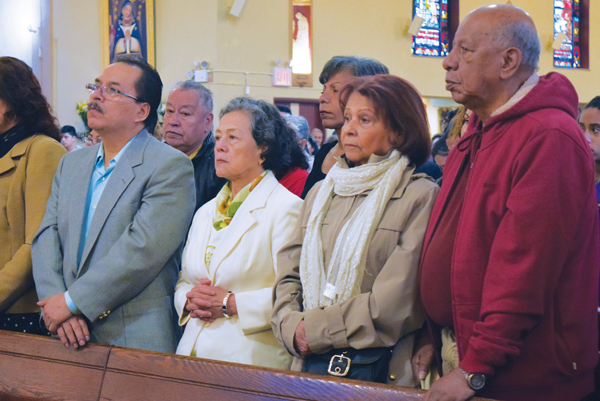 Bishop Nicholas DiMarzio and Auxiliary Bishop Octavio Cisneros joined the diocesan Ecuadorian community April 30 at Blessed Sacrament Church, Jackson Heights, to pray for those who died and suffered as a result of the South American earthquake. Bishop DiMarzio celebrated Mass at Blessed Sacrament Church, Jackson Heights, for those affected by the April 16 earthquake in Ecuador. Photos by Antonina Zielinska. The 7.8-magnitude earthquake on April 16 was the strongest Ecuador experienced in decades killing more than 600 people, hitting among the most impoverished areas of the coastal country. “Our prayers are always with you here present and those suffering in Ecuador,” Bishop DiMarzio said before the congregation in Spanish. He also assured them that the diocese is with them to support them. The Mass was an opportunity for the Ecuadorian community to pray together for their homeland. The bishop also designated May 15 as the Sunday when all parishes will take up collections to be offered to Catholic Relief Services and to individual dioceses in Ecuador. Veronica Cabrera, a native of Ecuador and parishioner of Our Lady of Sorrows, Corona, brought her young son and cousin to the Mass because she said she believes prayer to be the most important thing. Cabrera said she brought the two boys along because she wants them to grow up to be men who care about others suffering. She said she has been heartened by the support Ecuador has been gaining on social media including by the #TodosSomosEcuador. Bishop Cisneros, who delivered the homily, said that it is hard even for him to understand how nature can bring about such devastation on humanity. He said the cross does not erase pain, but makes it lighter and provides hope. Although Bishop Cisneros acknowledged that hope at such a time may seem abstract, he said it cannot be abandoned. He said it is hope and love that are the strongest weapons Ecuador, or any suffering people, can have. However, he said all faithful must be weary of the enemy of hope and love: indifference. “We are here because we want to unite ourselves with the people of Ecuador because we are one,” he said. 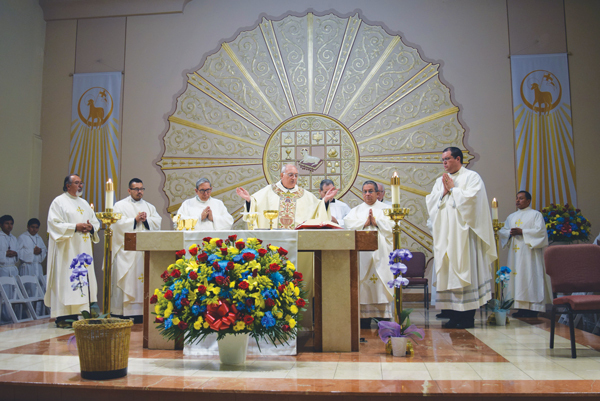 Father Carlos Quijano, S.J., pastor of Sacred Heart, said that as a native of El Salvador, he can relate to the pain of the Ecuadorian community. His native land is also prone to devastating earthquakes. He said that Ecuadorians now need someone to offer them presence and an open ear and heart. They also need help organizing relief efforts. He said he tries to open his church and his priesthood to the people who are now suffering. At the end of the Mass, a legislative member of the Ecuadorian government representing U.S. and Canada, Ximena Peña, was invited to speak. She spoke of efforts to grant Ecuadorians Temporary Protected Status (TPS) from the U.S. Citizenship and Immigration Services. TPS is granted to countries that have extraordinary and temporary conditions such as civil war and environmental disasters. It allows nationals in the U.S. protection from deportation and may allow them to travel abroad. The ability to travel abroad is what much of the Ecuadorian community most yearns for, Father Quijano said. Because many of the Ecuadorians in Jackson Heights are unable to legalize their stay, they cannot go home to mourn the dead and support their families and their fellow countrymen and women.